Napoli came from behind to thrash Empoli and restore their two-point lead at the top of Serie A.
Juventus went top earlier in the day by winning 4-0 at Chievo and had hopes of staying there when Leandro Paredes put Empoli in front. 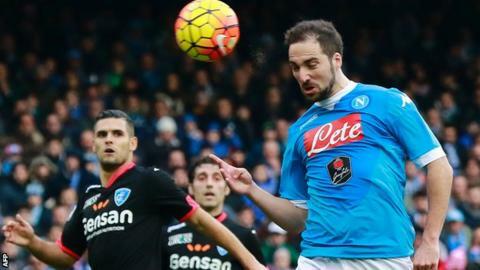 Gonzalo Higuain headed the home side level from a cross by Lorenzo Insigne, whose lovely free-kick made it 2-1. Michele Camporese's second-half own goal extended Napoli's lead before Jose Callejon struck twice late on. Camporese, making his Empoli debut after signing from Fiorentina last July, turned Callejon's low cross into his own net. Higuain's goal was his 22nd in 22 Serie A appearances this season, and helped his team to a sixth successive league win. But the Argentina forward was taken off in the second half, seemingly as a precaution, after he appeared to injure his back in a collision with Skorupski. Match ends, Napoli 5, Empoli 1. Second Half ends, Napoli 5, Empoli 1. Goal! Napoli 5, Empoli 1. José Callejón (Napoli) right footed shot from the right side of the box to the bottom right corner. Assisted by Dries Mertens with a cross. Attempt missed. Mário Rui (Empoli) left footed shot from outside the box is high and wide to the left following a corner. Corner, Empoli. Conceded by Kalidou Koulibaly. Attempt blocked. Piotr Zielinski (Empoli) right footed shot from outside the box is blocked. Assisted by Leandro Paredes. Foul by Manuel Pucciarelli (Empoli). Foul by Dries Mertens (Napoli). Lorenzo Tonelli (Empoli) wins a free kick in the defensive half. Goal! Napoli 4, Empoli 1. José Callejón (Napoli) right footed shot from very close range to the bottom right corner. Assisted by Dries Mertens with a cross. Substitution, Empoli. Rade Krunic replaces Daniele Croce. Hand ball by Marcel Büchel (Empoli). Attempt saved. Marcel Büchel (Empoli) left footed shot from outside the box is saved in the centre of the goal. Assisted by Daniele Croce. Marek Hamsik (Napoli) wins a free kick on the left wing. Substitution, Napoli. Dries Mertens replaces Lorenzo Insigne. Offside, Napoli. Jorginho tries a through ball, but Lorenzo Insigne is caught offside. Raúl Albiol (Napoli) wins a free kick in the defensive half. Offside, Napoli. Allan tries a through ball, but Lorenzo Insigne is caught offside. Substitution, Napoli. Manolo Gabbiadini replaces Gonzalo Higuaín. Attempt missed. Marek Hamsik (Napoli) right footed shot from outside the box is high and wide to the right. Assisted by Jorginho with a cross following a corner. Corner, Napoli. Conceded by Mário Rui. Attempt missed. Gonzalo Higuaín (Napoli) right footed shot from outside the box is high and wide to the right. Assisted by Marek Hamsik. Substitution, Empoli. Levan Mchedlidze replaces Massimo Maccarone. Attempt missed. Michele Camporese (Empoli) header from very close range is close, but misses to the left. Assisted by Leandro Paredes with a cross following a corner. Corner, Empoli. Conceded by Marek Hamsik. Corner, Empoli. Conceded by Raúl Albiol. Foul by Massimo Maccarone (Empoli). Attempt saved. Gonzalo Higuaín (Napoli) right footed shot from the centre of the box is saved in the centre of the goal. Attempt blocked. Marek Hamsik (Napoli) right footed shot from outside the box is blocked. Assisted by Gonzalo Higuaín. Attempt missed. Piotr Zielinski (Empoli) left footed shot from outside the box misses to the right. Assisted by Daniele Croce. Simeone - perfect Premier League fit? Read more on Diego Simeone: Is Atletico Madrid boss a perfect Premier League fit?